Gold Turtle. Motorcycle gold charms. 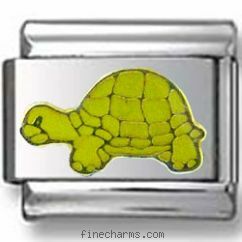 The time is creeping by with this charming Turtle on your bracelet. The link features turtle carved by hand and placed on a shiny stainless steel. Painted in bright yellow enamel and accentuated with gold toned lines and casing, the image looks gorgeous above glossy metal. Place the image of your favorite animal or create a piece of desert on your bracelet with a whole bunch of 9 mm Italian charms from our Animals category.